Underwater metal detecting is something that very few prospectors have tried. There aren’t many detectors on the market that are waterproof, and the one’s that are waterproof were designed more for coin and relic hunters at the beach. There haven’t been very many options for the gold prospector to metal detect underwater. There is a big different between a metal detector that is waterproof and one that is water-resistant. There are lots of detectors that are water-resistant, but you don’t actually want to search underwater with these detectors. They are resistant to rain, and you might be able to accidentally drop them in the water for a few seconds without harming them, but you definitely don’t want to hold them underwater for a considerable length of time. A truly waterproof detector can be submerged indefinitely without damaging the electronic components. Always read the specification for a specific detector to make sure it will work for your prospecting needs. Below are a few of the recently released waterproof detectors that will work well for underwater gold nugget detecting. 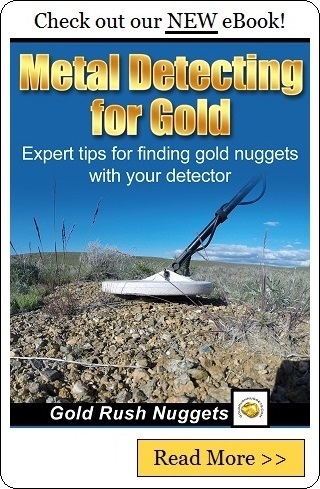 The AT Gold is a VLF metal detector that is particularly good at finding small gold nuggets. Most of the people that use it hunt on dry land, but it is waterproof to 10 feet so it can easily be used in shallow water areas to search for gold in areas that other detectors can’t go. This is your lowest cost option for a dedicated waterproof gold detector. The ATX was released in 2013, and it was the first pulse induction type detector that is both waterproof AND specifically designed for gold prospectors. Earlier models of waterproof PI’s were not particularly good for prospecting, and few people had success using them. The is capable of finding small and large gold nuggets alike to a depth of 10 feet. Perhaps my favorite option for underwater nugget hunting today is the Minelab SDC 2300 . This is a company that has built a reputation for making some of the best gold nugget detectors on the market. In fact the SDC2300 is now a favorite of many nugget hunters on dry land. The fact that it can also be submerged in water is another added benefit. It has some really neat features that the other detectors don’t have, but the price is a bit higher than the Garrett ATX. Depending on how you are hunting, you may not actually need a detector that is completely waterproof. If you are hunting shallow waters, you can use a waterproof coil on a non-waterproof detector and still search waters that are up to 2 feet deep. This is just fine for working many small creeks or along the edges of a river. You won’t be able to search the deep water, but you can still search in areas that most other detectors can’t go. Just be careful not to slip and drop the main housing of your detector in the water! If you are working shallow waters, then detecting isn’t all that different in water than it is on dry land. Slowly sweep the coil overtop of bedrock and recover any metal objects that you find. The bigger challenge is recovering targets. Underwater target recovery is a lot more difficult that in dry ground. Rather than a large digging tool, smaller crevicing tools may be more efficient at removing gold from bedrock cracks. Carrying a basic crevicing kit will help you speed up your target recovery. An interesting tip that I have known some suction dredgers to use is to metal detect the riverbed to locate paystreaks underwater that they can later dredge. Rather than bothering to dig out every target (most of which will be trash targets), they flag the location of each target underwater. After many targets are flagged, generally you will be able to see a trend in the targets, indicating a paystreak that the dredger can then follow. Even though all the targets are not gold, they are heavier metals like iron and lead, and they still settle in the paystreak in the same location that gold does.